In a past life (aka my twenties), I spent a lot of time writing, editing, and publishing poetry. I even got my Masters degree in writing it and published a book. These days, other things are higher on my list of priorities, but I still admire good poetry, it’s the word-based equivalent of watching Barcelona pass a soccer ball. Anyway, because about a zillion people try to write poetry, I used to get asked a lot how to go about publishing it. I wrote a few pieces about this for my personal blog, and after some years, those pieces still got more hits than anything else I wrote. 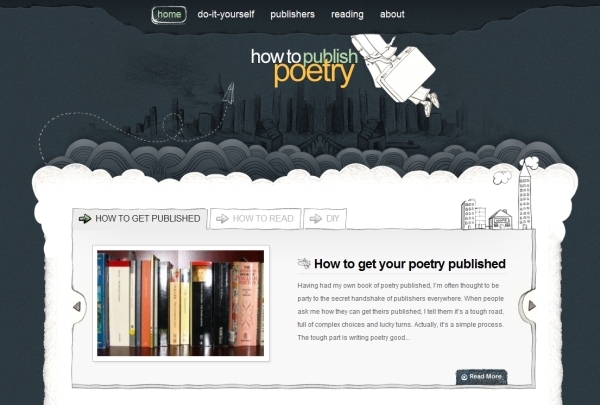 So I’ve taken that content and built How to Publish Poetry specifically for it. It’s advice for South African writers specifically, since I know my local scene best, and there’s not much help for writers in this part of the world. Tools used: The site has a WordPress CMS with the OnTheGo theme from Elegant Themes. Photos are either mine or they’re Creative Commons Attribution licensed pics from Flickr (attributed in the file names). Process: Register domain (we use Hetzner); install WordPress; download, install and set up the theme; create a site logo in Photoshop; find photos; paste past blog entries into WordPress as Posts and edit/update them; set up Google Adsense account; get Adsense code and paste into WordPress backend. All in all, probably about five hours’ work spread over several days, not counting several hours writing blog articles occasionally over a few years. Also, in order to make sure Google sent people to the new pages (instead of the old blog pages, which Google’s been sending people to till now), I added redirect instructions to the old site’s htaccess file. This is pretty technical for non-developers, and messing it up can break stuff, but I followed instructions on a few sites (like this one) and it all worked fine. The most difficult part of using the existing domain’s we’ve already registered is reliving the failure we’ve already come to terms with when we abandoned them. Initially I had great plans to digitize the soccer coaching manual I had scanned in a year ago. Given to me by the great friend and soccer fanatic Gareth Wilke, we set about selling this manual online when he confirmed the rights to sell it, given his co-authorship. Needless to say, my pedantic perfectionism built the project up to such great heights that the obstacles became to great to overcome. So, Coaching Soccer USA – A lesson in overcoming my all-to-common “I can’t because it’s not perfect” hurdle. 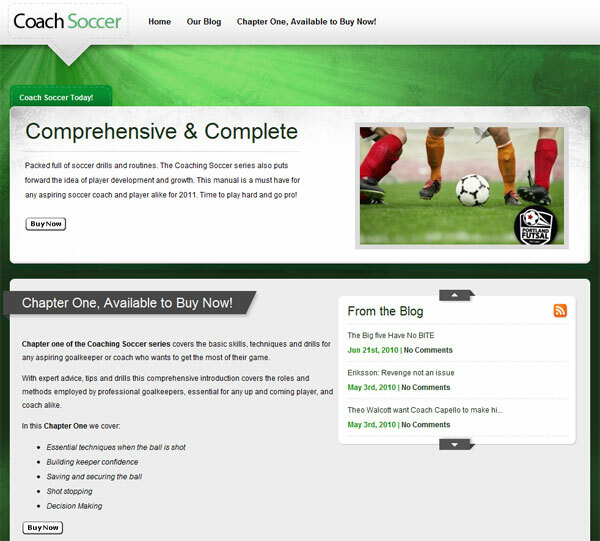 The soccer coaching manual that now sells for the laughably low price of $1.99 for the first chapter does not do the actual content any justice. The 5-page soccer manual is actually really great and I curse at myself that I hadn’t found the time between World of Warcraft raiding to digitize it properly and restore it to it’s former glory. Despite what the website may actually look like, the emotional investment in this project was massive and it eventually took a good few words via Seth Godin on ‘Quieting the Lizard Brain’ to push me over the edge and just ship it (no matter its current state). I’ve dragged Michelle in for this one. She’s an awesome cook, and has a great collection of cookbooks. She has a knack for buying amazing books and producing incredible meals from them. But sometimes she’ll buy a cookbook, or more likely I’ll get her one, and she just won’t find it useful. Sometimes the cover and the reviews just don’t tell you what you need to know. I reckon lots of people want reviews they know they can trust. How do you really know whether a cookbook is worth buying? Standing in a bookstore, you can’t cook from it. And most reviews on websites are all marketing copy or written by people who’ve only had the book a few hours. Books for Cooks is for finding out about books we’ve used and loved for ages. No quick-glance reviews here. These are books we have actually cooked from and learned from. The site’s designed as a niche store, and to monetize it, I’ve got affiliate links pointing to local retailer Kalahari.net and to Amazon.com. Mish and I will split the proceeds. 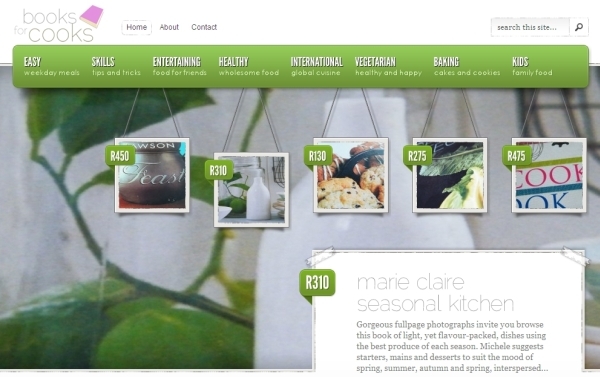 Tools used: The site has a WordPress CMS with the eStore theme from the fabulous Elegant Themes. I took all the photos of the books with Michelle’s Fujifilm FinePix S2000HD , resized and renamed them in batches using Faststone Image Viewer, and uploaded them directly (not through WordPress) with Filezilla. Process: Register domain (we use Hetzner); install WordPress; download, install and set up the eStore theme; create a site logo in Photoshop; take lots of photos and rename and resize them using Faststone; ask Michelle (nicely) to write a bunch of reviews; paste the reviews into WordPress as Posts; adjust the eStore themes settings for each Post; open affiliate accounts with Amazon.com and Kalahari.net; create affiliate links and add them to each post. Boom, done! All in all, probably about ten hours’ work spread over several days.